Decayed ripened tomato fruit contaminated with spores and toxins with relatively heat resistant could poised food poisoning in humans and animals. This research investigated the effect of antibiotic sensitivity of fungi and bacteria isolated from tomato (Solanum lycopersicum) fruit in Osogbo markets, Nigeria. One hundred decayed fruit of tomato were procured from three main markets (Igbonna, Oja Oba and Sabo) within the metropolis. Fungi and bacteria were cultured on Sabourand dextrose, MacConkey and Tomato juice agar media. Eight species of bacteria (Pseudomonas aeruginosa, Bacillus cereus, Bacillus subtilis, Proteus mirabilis, Salmonella typhi, Escherichia coli, Klebsiella aerogenes and Staphylococcus aureus) and six fungi (Rhizopus stolonifer, Fusarium spp., Mucor spp., Aspergillus niger, Saccharomyces cerevisiae and Penicillium spp.) were isolated and characterized. Fungal isolates were highly virulent compared with bacteria in the decayed tomato fruit. Sabo market had the most prevalence fungi and bacteria isolates, while Igbonna and the Oja‒Oba markets followed in that trend. Mucor spp. and Bacillus subtilis exhibited the highest fungal and bacterial counts of 42×104 cfu g-1 each in the Sabo market. Chloramphenicol was the most suitable antibiotic for controlling both micro flora. 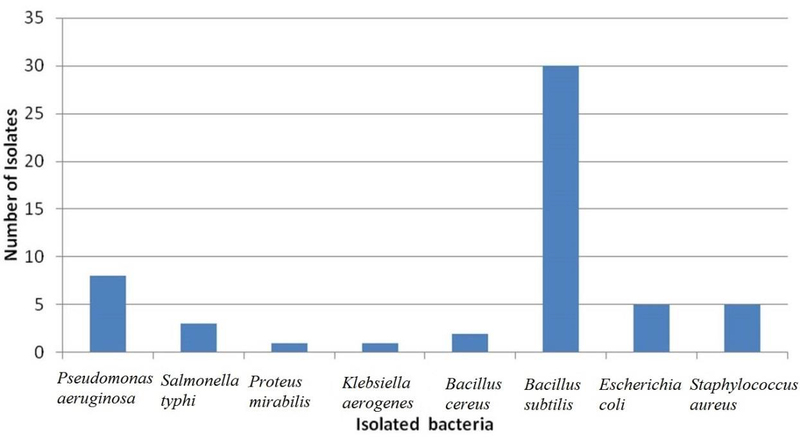 Except B. subtilis, varied degrees of antibiotic sensitivities and resistances were observed on all the bacteria. Technological improvement of harvesting, packaging, handling, storage and preservation could reduce tomato fruit losses and invariably enhance shelf life and quality. Fig. : Distribution of bacterial isolates in tomato fruit samples from three major markets in Osogbo, Nigeria.